The Temple Mount, a large plateau, includes the areas where the two Temples stood and where two Moslem Holy Places: the El-Aksa Mosque and the Dome of the Rock now stand. The Waqf has barred non-Moslems from the Temple Mount and established it as a symbol of Moslem Fundamentalism, spewing hatred of Israel, America, Jews and Christians. The denial of access is part of a basic strategy to de-legitimize Israel and to obscure the historic, fundamental, and intimate connection between the Land of Israel and the Jewish People. Thirty-six years ago, in 1967, the Jewish people returned to their historical, geographical, and spiritual heart: to Har-Habayit, the Temple Mount in the center of Jerusalem. 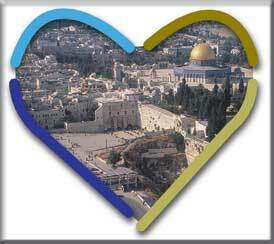 After 1800 years, the Temple Mount was opened to all: Jews, Christians and others as well as Moslems. After the Six Day War, in a spirit of peace and magnanimity, the State of Israel accorded the Moslem Waqf administrative control over the Temple Mount and its holy sites with the responsibility of providing open access to all. The Waqf breached Israel's trust and defied its responsibility. So that now, Christians, Jews and non-Moslems cannot visit the Temple Mount. The Islamic movement, under the leadership of Sheikh Raad Salakh, has established the Temple Mount as the main flagship in its struggle against the Israel, with the pretextual slogan "Al-Aqsa is in danger. To upgrade the Moslem status of the Temple Mount and to create the impression that it equates to Mecca and Medina, the Waqf is building new and illegal Mosques and attempting to obliterate every archeological and historical trace of Judaism at the Mount.